Carlos Saura is one of Spain's most respected and influential directors, heralded in particular for his exploration and use of the art of dance in films. The most famous of these is the Flamenco Trilogy – a pre-cursor to last year's Pina, from Wim Wenders – made up of Bodas de Sandre / Blood Wedding (1981), Carmen (1983) and El Amor Brujo / A Love Betwitched (1986). Choreographed by Saura and his leading man, world-reknowned Flamenco dancer Antonio Gades, the films were international hits, with Carmen winning two prizes at Cannes in 1983 and the BAFTA in 1985 for Best Foreign Film. Now all three have been confirmed for individual UK DVD releases by Studiocanal in April. 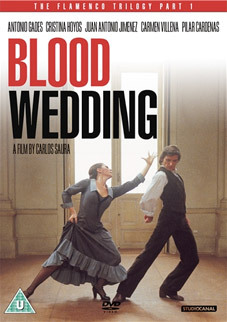 Blood Wedding is the first part of Saura's flamenco trilogy, followed by Carmen (1983) and El Amor Brujo (1986). A rural Andalucian tragedy, the film depicts Antonio Gades and his dance company performing a flamenco adaptation of Federico Garcia Lorca's play Blood Wedding, the intense and passionate story of a couple drawn irresistibly together in the face of an arranged marriage, with family vendettas raging in the background. The extraordinary thing is that the film doesn't chronicle the finished performance but a series of dress rehearsals, and yet the result is genuinely electrifying to watch. 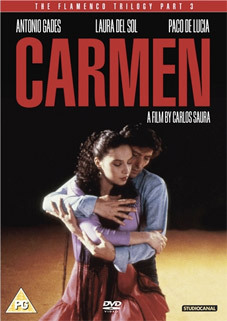 Carmen is the second part of Saura's flamenco trilogy and is the musical film adaptation of the novel Carmen by Prosper Merimee, using music from the opera Carmen by Georges Bizet. Art imitates art in this Bafta-winning film; choreographer Antonio is looking for someone to play the lead in his new dance work. He spots a young dancer named Carmen whose skills are unrefined but her wildcard spirit is just right for the operatic gypsy heroine who inspires lust and jealousy in a soldier. As Carmen is put through the paces of rehearsal, Antonio falls in love with her. But their affair begins to crack as Carmen's true character is slowly discovered and Antonio questions her loyalty. So popular was this cannes-feted depiction of the physical and interior world of dancers that in 1985 Gades mounted a popular touring version, with Saura serving as staging director and lighting technician, another tribute to their medium-transcending collaboration. 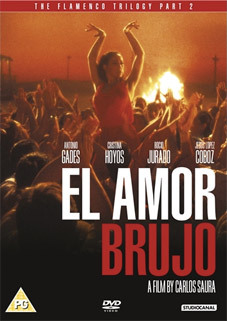 El Amor Brujo is the third part of the Saura's flamenco trilogy. The film is based on the gypsy ballet El Amor Brujo composed by Spanish composer Manuel de Falla, whose work is credited with legitimizing classical Spanish music for international audiences. A worthy tale of love, madness and the supernatural, El Amor Brujo begins with the small children Candela and José, who are promised in marriage by their fathers, but by the time they are of age another boy Carmelo (Gades) is heartbroken because he loves Candela (Hoyos) as well. Carmelo swallows his pain, even when José (Juan Antonio Jiménez, the groom in Blood Wedding) immediately takes a lover, sultry dancer Lucía (Laura del Sol otra vez). José is killed in a knife fight and bystander Carmelo is unjustly sent to prison for four years. Carmelo returns hoping to find Candela waiting for him, only to learn that she has gone mad: every night at midnight she walks to where José died and dances with his ghost. In desperation Carmelo turns to his aged aunt to find help on how to break the curse of the unfaithful ghost. All three films will be released on UK DVD on 23rd April 2012 by Studiocanal at the RRP of £15.99 apiece. There are no extras on any of the discs, allegedly. Carlos Saura will be also be participating in a Masterclass at the Ciné Lumière on Thursday 19th April, 6.30pm start. This will be followed by a screening of Carmen on Sunday 22nd April.